American football is back with the opening of the NFL regular season next week! Want to bet on the Seahawks to go back-to-back? How about Peyton Manning to be named MVP? Maybe you've seen into your crystal ball and want to predict the two finalists. Intertops Sportsbook will let you do all that and more, and with a great 20% kickoff bonus to boot. To claim the bonus, just make a real money deposit before the big kickoff between Seattle and Green Bay, and you could be entitled to up to $100 absolutely free. What's more, if you bet $5,000 during the regular season at odds of -200 or longer than a $500 free bet could be heading your way. 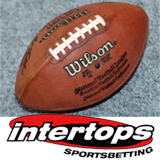 Intertops Sportsbook will have attractive odds on every NFL football game this season, plus a number of prop bets and season specials like MVP, 'Name the finalists', and Offensive and Defensive Rookie of the Year. The wait is almost over: NFL is almost back with us, and Intertops has it all covered, from match bets to futures and everything in between.